"It is the philosophy of The Goose Wines to achieve a perfect balance between the preservation of our natural resources and the creation of world-class wines." 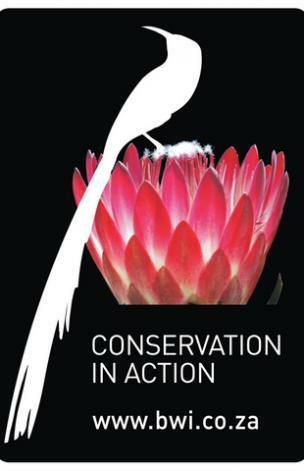 The BWI is a pioneering partnership between the South African wine industry and the conservation sector. Nearly 95 % of the country’s wine-growing takes place in the Cape Floral Kingdom (CFK), the richest and also the smallest plant kingdom on the planet. Recognised both as a global biodiversity hotspot and a World Heritage site, it has come under increasing threat from agriculture, urban development and invasive alien species. In 2004, faced with just 4% of the CFK’s unique renosterveld remaining and much of its lowland fynbos ecosystems under threat, the wine industry developed a conservation partnership with the Botanical Society of South Africa, Conservation International and The Green Trust, which led to the establishment of the Biodiversity and Wine Initiative (BWI). Widely praised as a pioneering partnership between the country’s wine industry and conservation sector, its mandate is not only confined to protecting natural habitat. It also encourages wine producers to farm sustainably and express the advantages of the Cape’s abundant diversity in their wines. For more information, visit www.wwf.org.za. It is the philosophy of The Goose Wines to achieve a perfect balance between the preservation of our natural resources and the creation of world-class wines. Balanced with a biodiversity philosophy, we create a style and complexity of wine very rarely experienced. The total area of the farm is 437 hectares with a total of 68ha, or 15.6%, set aside for conservation. In this area one can find Berg Fynbos, as well as endangered Renosterveld. There are 5 large dams on the farm that host various natural residents, like Water Fowl and Geese, and in March 2007, a flock of wild Spur-Winged Geese, Africa’s largest and heaviest species of fresh water Geese, moved into the area and made one of the dams their home. 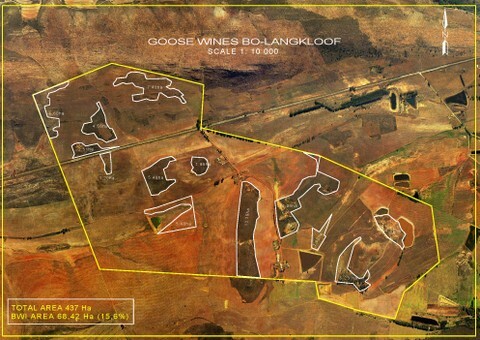 The Goose Wine Estate protects these wonderful birds, by making use of natural deterrents to protect the grapes from bird damage, especially during the harvest period. Special nets are used to cover the fruit to protect it from the bird’s hungry beaks, ensuring that vineyards and fowl live together in perfect harmony. Our vineyards thrive amongst the natural vegetation which includes a variety of Protea and Erica species. This results in grapes that are truly unique and the wines crafted from these fruits set them aside from any other. 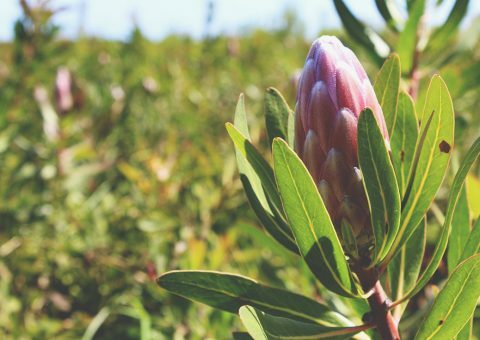 Particular care, precise farming methods and a comprehensive nature conservation program, protect and promote these endangered fynbos species. The eradication of alien plants is also an on-going process, with the ultimate goal to further promote the sustainability of the natural fauna and flora of this unique area. Since the Upper-Langkloof is known as a cool and dry landscape, with an average rainfall of between 250mm and 300mm, the viticultural team also has an extensive erosion control plan in place to ensure the minimum loss of water and top soil during the winter months. The use of mulch in the vineyards ensures that the little precious rain that does fall are maximised to the full, which further enhances the fertileness of the valley. With an extensive nature conservation management program in place and focus on the protection and sustainability of this unique eco-system, The Goose Wines are fully committed to the conservation of the Langkloof in its natural splendour. The Goose Wines is a full BWI member.